Paper Napkin is a basic necessity in our life for maintaining personal hygiene. Lotus Tissues is a manufacturer and a supplier of soft and gentle paper napkins produced from the finest quality of raw materials. These paper napkins are simple and convenient option which can be considered for carrying while travelling. Lotus Tissues also provides high quality printed tissues with custom design, message and logo as per the requirements. Our products are apt for corporate events, conferences and all kind of other occasions and hence are widely used in hotels, salons, offices, hospitals, hospitality, private parties and celebrations, etc. 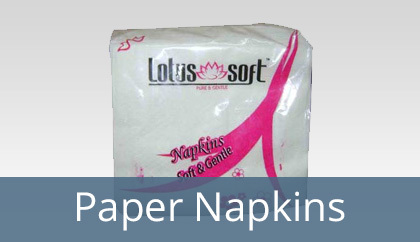 Avail the paper napkins from Lotus Tissues at the lowest price possible. Select from the wide range of options available from varieties of size, colour and pattern. Get it custom printed with whatever logo, image and messages you wish & use it as a promotional item. Display it in a fancy way by folding it to get the necessary shape. Save your other costs like laundry cost in Hospitality industry. Easily disposable and eco friendly than other kind of napkins.